Ahoy, crazies! Get ready to set sail (by accident) aboard the world’s worst cruise ship, the Fiesta Burrito. 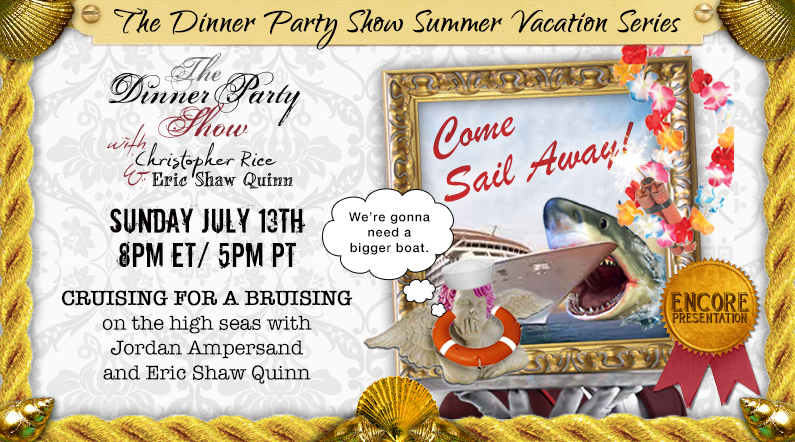 Before leaving town for a public appearance in New York City, TDPS co-host Christopher Rice hatches a secret plan to set Eric Shaw Quinn and critic-at-large Jordan Ampersand out to sea together. The disastrous results include a kiddie pool full of fake sharks and a cruise ship talent show featuring a bizarre appearance by the late Bea Arthur. Yes, this entirely original one-hour special is as crazy as it sounds. Enjoy!